This 1958 production was a Disney gift offered via television. 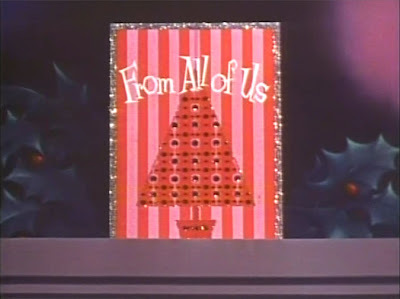 This special yuletide installment of "The Wonderful World of Disney" included new animation segments, as well as theatrical cartoons ("Toy Tinkerers") and non-Holiday segments from Disney classics: Peter Pan, Pinocchio, Lady and the Tramp, Cinderella, Bambi and Snow White. 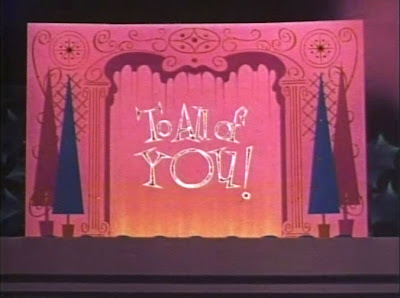 "From All Of Us, To All Of You" was also the show's memorable theme song. While the lovely holly and berries serves as the background, the star of this setup is the magical unfolding Christmas card. Perfect artwork to savor this time of year!